There’s nothing the media likes more than a peek into the sometimes secretive life of the president of Russian Federation, Vladimir Putin. And it’s not without reason! Whether he’s showing off his judo skills or taking a dip in the freezing cold river on a casual vacation to Siberia, this ex-KGB specialist never fails to amaze with his formidable fitness and youthful appearance. However, with a strong preference for keeping his private life – well, private, it is not that easy to find out how does the 65 year old Russia’s strongman stay in top shape. Luckily for us, despite being somewhat secretive about his daily routine, Putin talked about his views on health and fitness on numerous occasions, so it is still possible to connect bits and pieces and get a clearer picture of how does the Russian commander-in-chief stays in top form. So, grab a cup of green tea with honey and a bit of pirozhki, because we’re taking a look at health and wellness – the Russian style! Due to long working hours, Putin has been known as a night owl for quite some time now. And although it’s more a matter of necessity than preference, the bottom line is that more often than not, he doesn’t have an early start, usually eating some time before noon. After getting his dose of nutrients, Putin goes for a true feat of endurance – a two-hour long swim. While often underestimated as an effective exercise method, swimming is classified as low-impact cardio exercise. With the water providing constant resistance, it helps burning calories and building muscle at the same time significantly contributing to the overall fitness. However, while including swimming in your morning routine would do wonders for your health and wellness, taking a dip in the freezing cold rivers is not recommended for those who are not in their top form – or at least for those who are not former KGB agents. Here’s something to motivate you to Put-in some hard work! Weight training is an integral part of the 65-year-old Russian president, but that information is relatively new. The president only mentioned it once after the photos emerged showing him and former president, now prime minister, Dimitry Medvedev pumping iron at the presidential resort in Sochi. This one comes as no surprise. If something is well-known about the Russian president than it’s his love for outdoor activities. In fact, Putin spoke numerous times about how spending time in nature and indulging in a simpler life of fishing, walking and horseback riding helps him take a nice break from the busy world of international politics in the Kremlin. But, it’s not all about mental fitness. 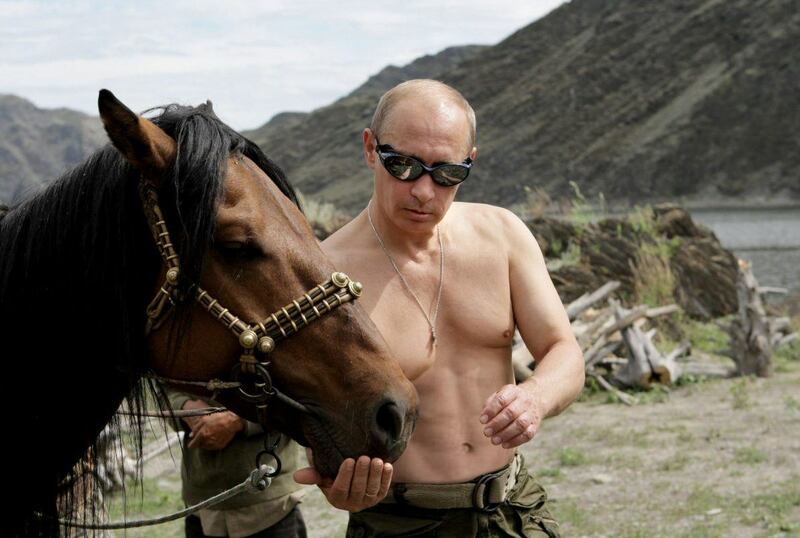 Substituting a lazy day at the beach for an active vacation in nature is a great idea if you’re planning to look like Putin when horseback riding shirtless in your sixties! Another fact that is widely known about the Russian president is his love an admiration of judo. And the media simply love ex-KGB agent’s regular displays of his proficiency in this martial art. Putin spoke very highly of judo and sport in general on numerous occasions, including Sports and Fitness day, his annual Q&A sessions and different interviews. The Russian president also shared some details of his youth with the general public and while this may come as a surprise for some, his childhood years, marked by a personal tragedy of the Second World War and the bleak post-war years has led him to the streets of Saint Petersburg. Many years later, the president recalled, it was judo that helped him get back to the right path. According to him, there are many life lessons that one can derive from engaging in sports, not to mention the health benefits! Stay Away from Bad Habits! Despite all the vodka jokes, Putin is not a big fan of alcohol. While he recognized the tradition of making a toast on camera on numerous times, he also often spoke against overindulging in alcohol or other vices. His extreme dislike of tobacco led to a couple of friendly arguments with his friend and foreign minister Sergey Lavrov, a passionate smoker, famous for fiercely opposing the smoking ban within the UN building. Aside from this, Putin used every occasion to communicate with the Russian youth and spread the awareness of the benefits of a healthy lifestyle. Most notably, the Russian president unexpectedly appeared at a rap battle and breakdance competition, where he addressed the participants, noting that breakdancing is an intense physical effort which cannot be compatible with drugs or alcohol. Putin’s official doctor, Sergei Mironov once stated that the president is often sceptical about medication. However, that does not mean that he doesn’t use all the benefits modern medicine can offer. For one, Putin personally stated that he prefers to prevent flu with vaccination as opposed to treating it. However, when it comes to staying healthy and boosting immunity, this ex-KGB agent still prefers so-called “grandmother’s remedies” like tea with honey, lots of fruits, sauna or a massage to keep him in top shape.